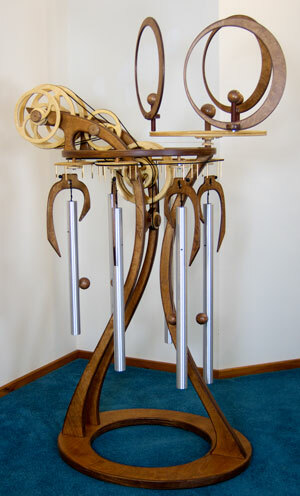 Using chime tubes to create musical sounds within a sculpture has intrigued me since I was located next to Woodstock Percussion at a craft show 25 years ago. Over the years I've incorporated chime tubes in several different sculptures. I discovered the Chimes of Apollo a couple of years ago. "Someday I'm going to use these," I thought. This year was the year. The challenge was complex. The chimes generate sublime tones with incredible resonance and are tuned to an ancient Chinese Pentatonic scale. I wanted to control the striking of each chime tube in a random sequence of cords and trills. The mechanism for doing this had to be silent and yet also create some interesting patterns of motion. I started slow. First developing a striker mechanism and then laying out the rest of the piece. Along the way I had to learn a new 3D program so I could visualize all the complex spacial/mechanical problems and animate the solutions. I was thrilled when the assembly actually worked and I then spent literally months just listening and perfecting the sound and motion. This is by far the most complex piece I've offered for sale. It is also the most challenging and rewarding piece I've done. It has to be experienced to be appreciated. Enjoy the sounds and sights!